The I-Beam Connector Clamp is one of those simple products that, if you have the need, then it is absolutely perfect. For Gantry Crane owners that have built one of the Mechanical Elements cranes, this product may be the perfect enhancement for you. Now for a limited time, get your I-Beam Connector Clamp Plans for Free. Use the coupon code “Clamp4Free17” at checkout for Free Plans. All Steel design. (Aluminum for the clamp is not recommended). Works on Steel or Aluminum I-Beams. Build it to fit the I-Beam size and the system you are using. 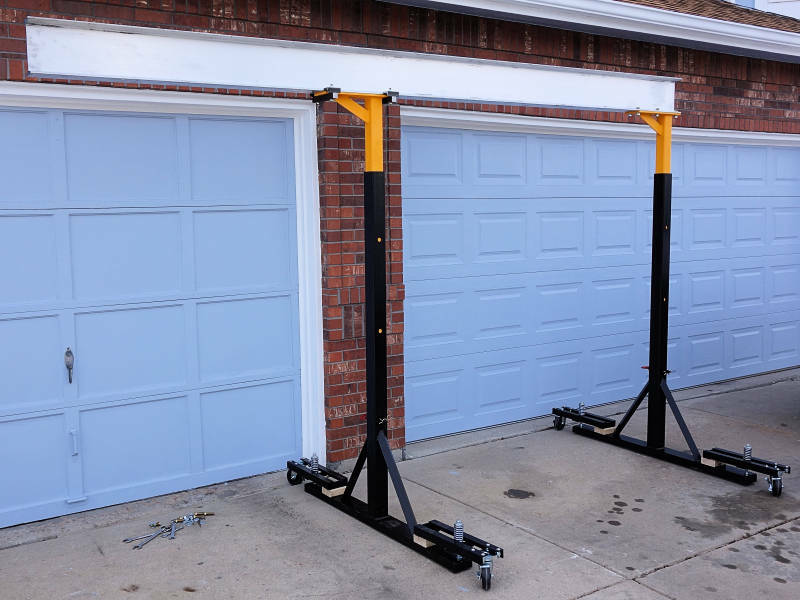 Made specifically to go with one of these Gantry Crane Plans — Mobile, Garage Size, Upsize. Capacity is dependent on materials and components – steel, bolts, thread pitch, etc..
Plans include drawings, instructions, and explanation of required materials. Images on this page include both computer generated (CAD) images of the design, as well as actual photographs of the Beam Clamp in action. The design is simple, and the implementation is easy. 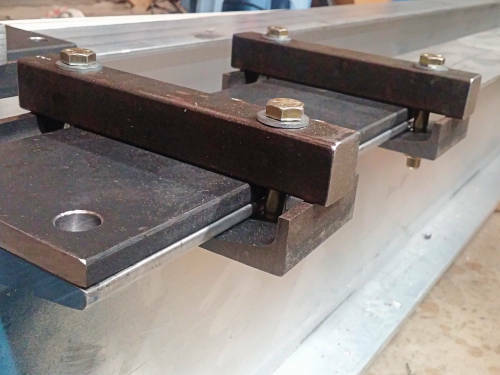 The intent is to clamp a flat plate onto the face of an I-Beam without drilling holes in the I-Beam. Infinitely variable positioning of the clamping and plate along the beam is then possible. Plans show dimensions that make the clamps fit specific I-Beam applications. As shown in the image, some simple calculations will adjust sizes to fit based on the beam and plate needs. This will make the beam connector clamp fit the given I-Beam and plate perfectly so clamping is secure and robust. This system of dimensioning makes it easy to build clamps for any size I-Beam. Why use this system to fasten your gantry crane I-Beam? Here is a list of applications where this clamp system is particularly helpful. For more detail, then please read the related Mechanic’s Post introducing this I-Beam Connector Clamp as a new product for Mechanical Elements. Beam Clamps give the ability to adjust distance between the legs of the Gantry Crane without drilling more holes. This makes the crane easier to store, and easier to work around other equipment. 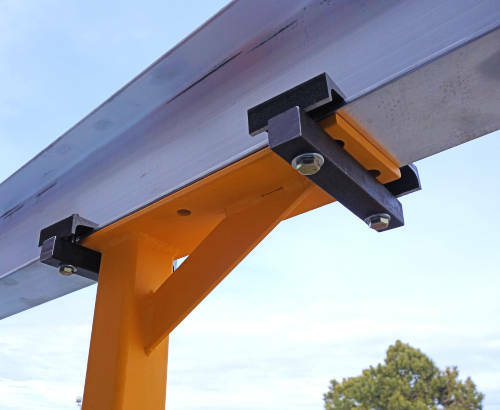 The effective I-Beam length (distance between the crane legs) is a big part of crane capacity, so shortening the distance can increase crane capacity. See this Mechanic’s Post for details. For special cases, and for light loads, the over-hanging portion can act as a cantilever beam crane, though with drastically lower loads. When used this way, a proper counter-balance is required at the other end of the beam for safety. The I-Beam Connector Clamp can be used to attach other items to the beam in a non-permanent way, and without drilling holes into the I-beam. The extra item need only have a flat plate to match the beam. Mount the I-Beam Connector Clamp anywhere along the beam, then it will act as a very effective trolley stop. Just slip a plate under it for proper clamping height. Again, please read the full application guide in This Mechanical Elements Post. These are the perfect gantry crane accessories. Download your plans here at Mechanical Elements .com and build some yourself. Construction requires steel cutting and drilling (welding is NOT needed). Plans include easy to follow, fully illustrated instructions. . . . More on What is in the Plans . . . These are the perfect accessories to go with one of our Mobile Overhead Gantry Cranes! * Load capacity will vary with materials, construction techniques, assembly methods and load distribution. Do not exceed manufactures limits. Always use Extreme Caution when lifting. And, You Can’t Buy These At The Store.